Joshua, Judges and Ruth for Everyone is part of the series of books by John Goldingay that offer readers a daily study guide to the Old Testament. The book is written in an accessible and subjective style that has a "for everyone" approach. The Book is ideal a personal or group study resource. The dramatic accounts in the books of Joshua, Judges and Ruth take us from the cusp of Israel's entering the Promised Land to the eve of the founding of its monarchy. The high adventure (Joshua), horror (Judges) and love (Ruth) in these three books illustrate the spectrum of Israel's relationship with God: faithfulness and victory; sin and redemption; and loyalty and blessing. 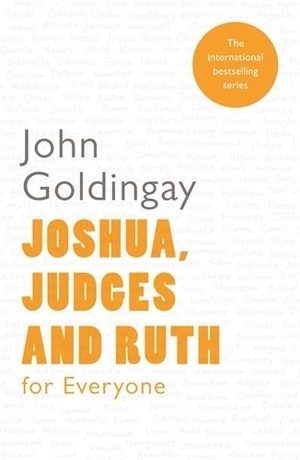 Joshua, Judges and Ruth for Everyone by John Goldingay was published by SPCK in March 2011 and is our 8115th best seller. The ISBN for Joshua, Judges and Ruth for Everyone is 9780281061280. Adventure, horror and love are the core scripture themes unveiled in John Goldingay’s great slimline commentary to three significant Old Testament books. There is pace, personality and wisdom abounding in this work. The scriptural insight and personal disclosures contrast the glory and purposes of God as well as the struggles and searches of our humanity. There is helpful application and strong-yet-sensitive exegesis. My frustration would only have been the size of scriptural inclusions and therefore how this consequentially minimised Goldingay's scholarly and soulful help! Accessible, engaging and faithful to the salvation story of God! Got a question? No problem! Just click here to ask us about Joshua, Judges and Ruth for Everyone.